Now that Mac is 6 months old I need to send out a Big Thanks to Regency Poodles for giving him such a great start. Mac has always been very brave and out going. New situations never bother him. He learned how to cross a river, investigate a beaver dam and plow through a field with grass over his head all within the first few weeks of him living on our farm. He quickly progressed to attending my Obedience club, shopping at Lowe's and visiting the farmer’s market. He's a dog that can go anywhere, meet everyone and he accomplishes all of this with full out enthusiasm. At 5 months old Mac made a 10-day car trip to Wisconsin for a visit with my girlfriend and also a stop for a UKC conformation dog show. Hotels, 8-hour car rides, new people, new houses – nothing bothered him! He even came away with a Best Puppy win. My husband and I both wanted a working dog and Mac will certainly fit the bill. I currently have him in training for SAR and he will be starting his hunting training very soon. Due to his breeding and his first 8 weeks of upbringing I know he will excel in all. Thanks again Ann for all you gave to your puppies. 6 months old: I can't say enough good about Juliette, Ann. I'm newly amazed everyday at how wonderful she is. We took her to the Georgetown square last night where she was a real gem. My mother fell in love with her and wanted to keep her. Permanently. Lol. Not a chance!!! Zoey is perfect! She slept in my lap going home. She hasn't had any accidents in the house, she played tug w me outside, and now she is totally pooped out. Thank you so much for your hard work, it totally paid off. 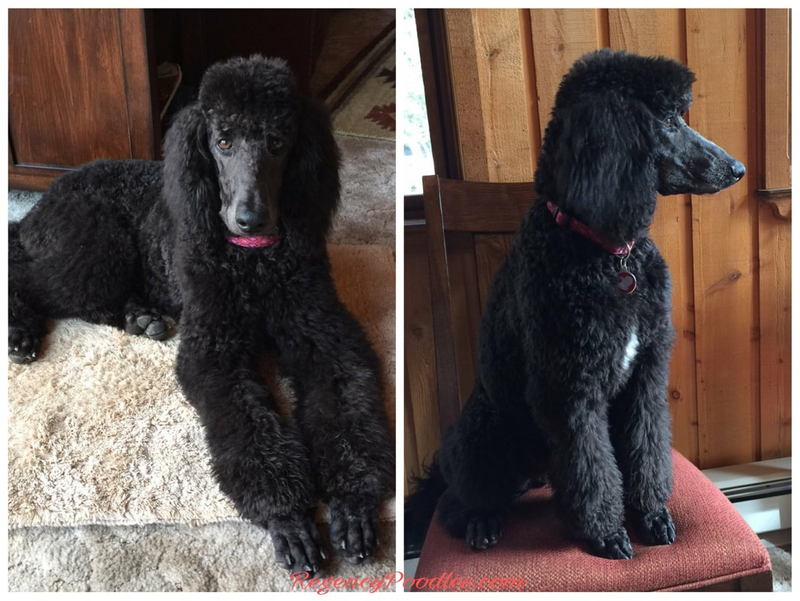 I'd like to give BIG KUDOS to Ann Conrad at Regency Poodles for being such an awesome breeder! As a total neophyte to both young puppies, in general, and Standard Poodle puppies, specifically, I can't tell you how blessed we are to have found her. Our New-to-Us Baby, has been given The Best pre-natal and post-natal care, nutrition, early socialization, testing, instruction, training and above all else, LOVE! Oh, Wait! That applies to us, too! We got all of that and more! Thank you Ann! And your husband and your mom and your family and friends for all that you have done.